Over the available sample period, SR rises (falls) during 210 (234) months. LR rises (falls) during 190 (254) months. Allocate relatively more to the term risk premium and less to the credit risk premium before SR rises, and the opposite just before SR falls. 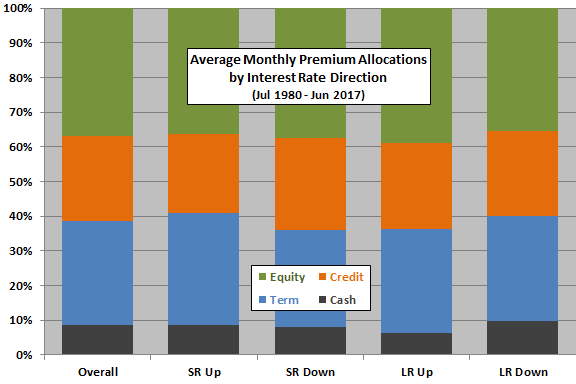 Allocate relatively more to the equity risk premium and less to cash before LR rises, and the opposite just before LR falls. How do findings about allocations translate to strategy performance? SACEVS Best Value and Weighted beat the 60-40 benchmark overall and for falling SR, rising LR and falling LR, but lose slightly to the benchmark for rising SR.
SACEVS performs much better when interest rates fall than when interest rates rise. 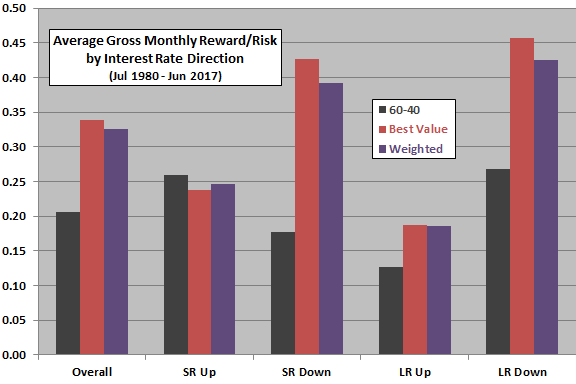 An investor who could predict the direction of interest rates would prefer both Best Value and Weighted to the 60-40 benchmark for most interest rate scenarios, but not for rising SR.
SACEVS outperformance generally derives from both a higher average monthly return and a lower monthly return volatility. In summary, evidence from available data suggests that SACEVS works better when interest rates fall but compares favorably to the 60-40 benchmark whether interest rates rise or fall. Interest rate direction measurements are blurred by use of monthly average interest rates. Other ways of measuring interest rate direction may affect findings.